Wolves are circling around Japanese Prime Minister Shinzo Abe. A scandal involving the sale of land to the Osaka kindergarten Moritomo Gakuen looks to be deepening, as does a second controversy surrounding the licensing of a private veterinary school. Some observers believe they threaten Abe’s third term as president of the ruling Liberal Democratic Party (LDP) and his tenure as prime minister. But the fatal blow to his prospects may come from another direction, however. Ironically, U.S. President Donald Trump could be the one that eventually tips the balance against the embattled prime minister. Moritomo Gakuen is a Japanese preschool famous for having students recite daily the Imperial Rescript on Education, a Meiji-era document intended to inculcate national pride and spirit. That nationalist inclination won the school the admiration of Abe and his wife, Akie, who was invited to give a speech at the school and was later named honorary principal of the school. In February 2017, newspapers reported that the previous year, the school had purchased a parcel of government-owned land in Osaka for about 14 percent of its assessed value. The price was discounted to 134 million yen (around $1.27 million) because the land was supposedly contaminated by waste, although it was rumored that pressure from prominent patrons played a role as well. The government then reportedly reimbursed expenses of 120 million yen incurred to clean the property. The president of the school also claimed in Diet testimony that the prime minister and his wife donated 1 million yen to the school; Abe denied making the gift. When the issue came up in the Diet, the Ministry of Finance first claimed that all records of the transaction, other than the contract itself, had been destroyed in accordance with document retention regulations. Opposition politicians pursued the matter and forced the Ministry of Finance to retract that statement; the missing paperwork was eventually found. Earlier this month, however, it was discovered that the documents given to legislators had been altered, with the names of prominent politicians, including “some with Cabinet experience,” and that of Akie Abe, removed. Abe himself has denied involvement in or knowledge of the sale or the subsequent document alterations. There is no evidence to contradict that claim, but the public has its doubts: in one recent poll, 68 percent said that Abe bears responsibility. The public disagrees. In one poll, over 70 percent of respondents said Aso should step down. While his resignation could provide the head the public and the opposition wants, it has political implications for the prime minister: Aso heads the second largest faction of lawmakers in the LDP, and his departure could fracture the consensus within the party behind Abe and spark a leadership challenge in the LDP presidential election to be held this fall. A second scandal also refuses to go away. It surrounds the decision last year to grant a license to a friend of the prime minister to open a veterinary medicine school in a National Strategic Special Zone in Ehime Prefecture. In this case, it is alleged that the prime minister’s office pressured the Ministry of Education to permit Kake Educational Institution to open Japan’s first new veterinary school in half a century. Again, the government first denied that there were any documents concerning the deal, a statement that was proved false. And again, a document appears to have been altered, with the names removed of individuals who attended a Tokyo meeting to discuss the school. It is unclear who in the prime minister’s circle purportedly pressed to approve the license. The scandal assumed new life amid reports of harassment of a former senior education ministry bureaucrat who said in the Diet and in interviews that the administrative process was “distorted” because of pressure from officials close to Abe. After it was reported that the former official was going to speak at a Nagoya junior high school, officials from the Ministry of Education, Culture, Sports, Science and Technology questioned the school board over the decision to invite him to speak and provided over a dozen questions to answer, including some that addressed the bureaucrat’s character. The scandals are taking a toll. A recent Nikkei poll revealed that support for the Abe Cabinet had fallen to 42 percent, a 14-point drop in one month (nonsupport was 49 percent, a 13-point increase.) Those numbers are consistent – both in overall level and recent changes – with recent Mainichi, Nippon TV, and Kyodo polls. These are worrisome numbers, and not only are there questions about whether Abe will win re-election in the fall LDP presidential election, but some even wonder if he will remain in office that long. But the greatest threat to the Abe administration could come from a different direction: Washington. Abe has built a strong relationship with President Trump, forging arguably the “gold standard” for relations with the current occupant of the White House. That is important because managing the alliance has been a must for any Japanese prime minister. Yet there are reasons to worry that his relationship with Trump is becoming a liability for Abe. First, consider public perception. 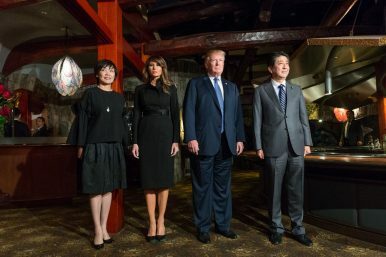 According to a Pew survey, just 24 percent of Japanese people think Trump will “do the right thing.” In that poll, 62 percent of Japanese identified U.S. power and influence as a major threat to Japan. The value of that relationship will soon be tested further. The first issue is the Trump administration’s imposition of tariffs on steel and aluminum imports. Japanese officials and businesses have complained about the move, with Foreign Minister Taro Kono saying that the measure “could have a grave impact on the economic relationship of Japan and the US.” He along with other Cabinet officials have called for Japan’s exclusion from the tariffs as a U.S. ally. Failure to get a waiver would expose the much-vaunted special relationship as meaningless when it counts. The second issue is North Korea. No countries have been closer that Tokyo and Washington in dealing with North Korea up till recently, both demanding maximum pressure and refusing to make concessions to Pyongyang until it commits to complete denuclearization and makes concrete moves in that direction. Yet Abe was not informed of Trump’s readiness to accept Kim Jong-un’s purported offer to meet and discuss bilateral relations and Tokyo has scrambled to keep up ever since. Exhibit A is Abe’s hastily arranged trip to Washington in April to meet Trump before he sits down with Kim. Trump appears ready to turn his back on his ally to make a deal with Kim, suggesting again that the special relationship means little to the president when he is tempted to make history. As a result of these ongoing trends and developments, one of the factors that Abe could claim justified a continued stay in office – the ability to manage relations with the United States – has been exposed as hollow. Abe’s courtship of Trump was intended to head off surprises and to insulate Japan from the reversals in foreign policy that Trump delights in making. In these two cases, that strategy has not worked, and Abe is now burdened with all the liabilities of a close association with Trump and none of the purported benefits. Abe’s experience has already become a warning about the cost of excessive reliance on a leader’s personal relationship with the president to buttress a country’s relations with the United States, even if it is an ally like Japan. The question now is whether this will cost Abe his job as well. Brad Glosserman is a visiting professor at Tama University’s Center for Rule Making Strategy and senior advisor to Pacific Forum International, a Honolulu-based think tank. Does Another Election Loom in Japan?End of the Beginning or Beginning of the End for Shinzo Abe?Japan Opposition Party Leader Backs 'Limited' Collective Defense ProposalPoll: Shinzo Abe's Approval Falls to New Low Amid Scandal FalloutIs This the End for Shinzo Abe?